The code with high byte or low byte selector doesn't seem to work. LDA #$44 stays that way instead of changing to LDA #<$44 in the display. Now I'm seeing random crashes when I save the workspace (Ctl-S) or doing things like "change to WORD or change to BYTE). It only seems to crash in double height mode though, and only in higher segments, like say the third or fourth. I know it's a bit vague but it's only just started. I'll see a little window open that says "Disassembling please wait... Pass: 4 Segment: 6". It will occasionally crash in not double height, but that window does not appear on the rare occasion that it does. Edit: the saving workspace crash seems to only happen if I select it from the dropdown box. CTL-S seems to work. Segment 6 is the key I guess. I'm actually working in segment 3, although there are six segments. segment 6 is the $02E0 run, so the address/offset I'm editing does not appear in segment 6, so presumably that's why it crashes. Edited by Alfred, Tue Apr 16, 2019 9:31 PM. Thanks for all the feedback, I hope I'll find time soon to look after them. If only I had enough money to pay you to not work......! Of course that also goes for all our other elite devs on the Atari 8 bit scene. Finally an update as been uploaded. FIXED: No more dumps when deleting segments from the segment list via context menu. FIXED: No more dumps when adding user comments. FIXED: No more dumps when loading segment with full 64k. Such segment Are now display correctly in the segment list. The dump windows cannot handle full 64k segments, because it uses $ffff as marker. Split the segment if you really need to work with it. 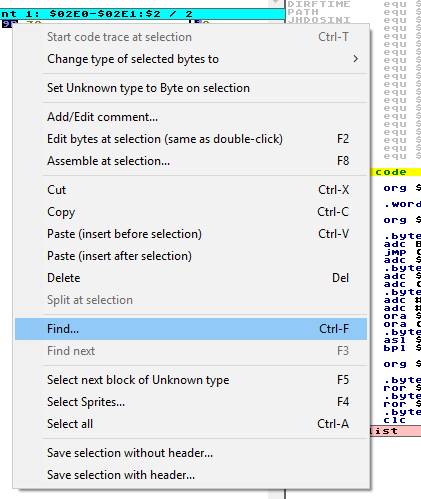 FIXED: Context menu in disassembly window appears again. 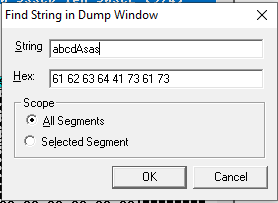 FIXED: Strg-F opens "Find in Dump Window". I've check the original V2.2, there Strg-F also opens the "Find in Dump" and not "Find in Disassembly" if the disassembly window has the focus. The reason is that there is actually no such thing as "the view with the current focus", because DIS6502 is not MDI application. All views as simply there. FIXED: Selecting "Quit edit mode" actually quits edit mode again (besides ESC). CHANGED: Find in Dump dialog now formats hex outout with spaces and accepts spaces as separators for readability. CHANGED: Order of entries in the dump context menu is not according to the Windows standards and guidelines. 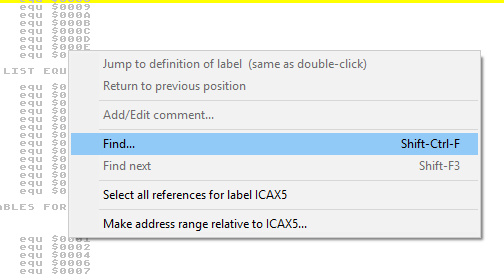 CHANGED: Comment dialog now trimms trailing whitespaces and return characters. CHANGED: "String not found" dialogs now also display the string that was not found. CHANGED: Modal dialog have a proper application title as caption. There are still major bugs in the handling of the labels, etc. but many things in the code have been reworked. So at least it should be easier to track down the remaining issues. Doesn't seem to work. All the windows are blank. something gets focus in each window, but it's like every control is invisible. Could be an issue with Windows caching the font, please try a reboot. Code with low byte or high byte still doesn't work.